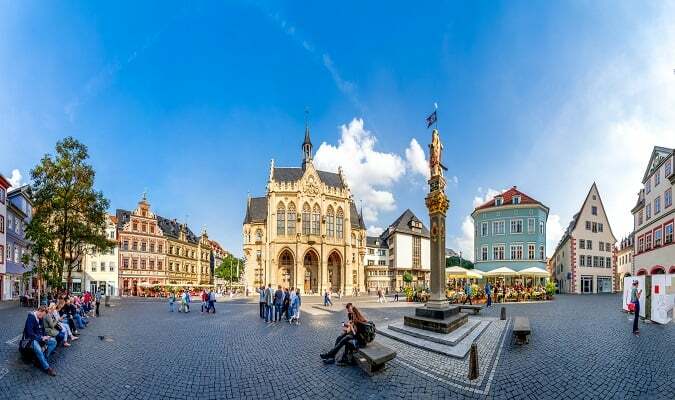 Erfurt is the capital and largest city of the state of Thuringia in Germany. The ancient city of Erfurt is one of the most intact medieval cities in Germany, as it suffered little damage during World War II. 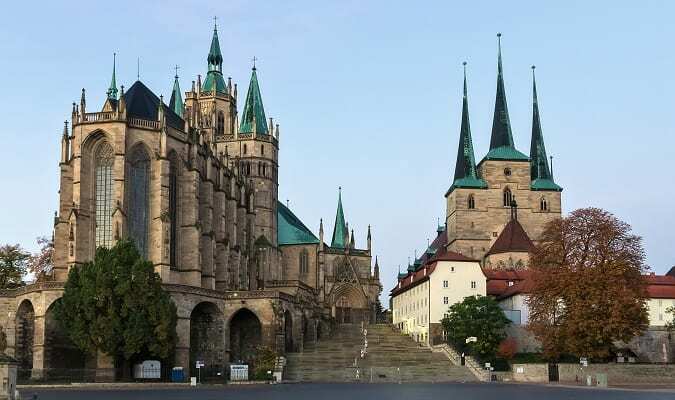 The Erfurt Cathedral also known as Dom St Marien was founded in the 8th century. The cathedral has 3 towers of the 19th century, the one in the middle houses the largest medieval bell in the world. The Severikirche is a church with Gothic style. It is located on the Domplatz along with the Erfurt Cathedral. 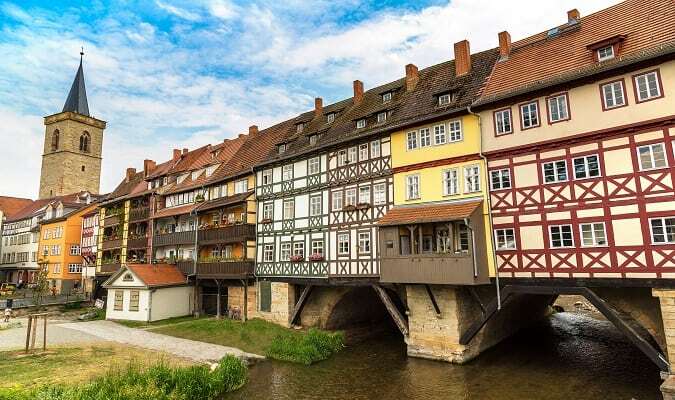 The Krämerbrücke is the longest medieval bridge with buildings next to it than anywhere else in Europe. It is 120 meters long and crosses the Gera river. The Fischmarkt houses the Roland Statue of 1591 and the Rathaus. The Rathaus is a neo-Gothic building built between 1870 – 1874. In the Rathaus there are numerous murals depicting scenes from Martin Luther‘s life and images from the history of Erfurt. The Alte Synagogue was built around 1110. 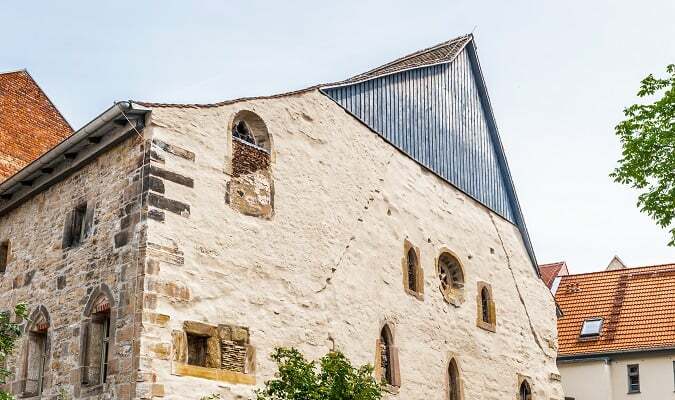 It is one of the few well-preserved synagogues of this type in Europe. Evangelisches Augustinerkloste is a 13th century monastery. It was at the site that the young Martin Luther became monk in 1505. 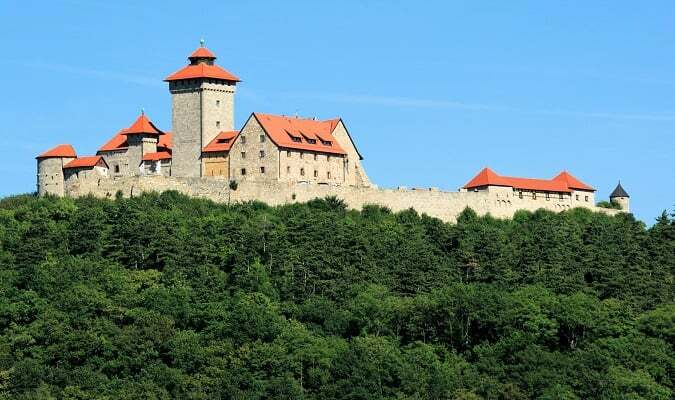 The Petersberg Citadel is the largest and best preserved baroque fortress in Central Europe built in the 17th century. 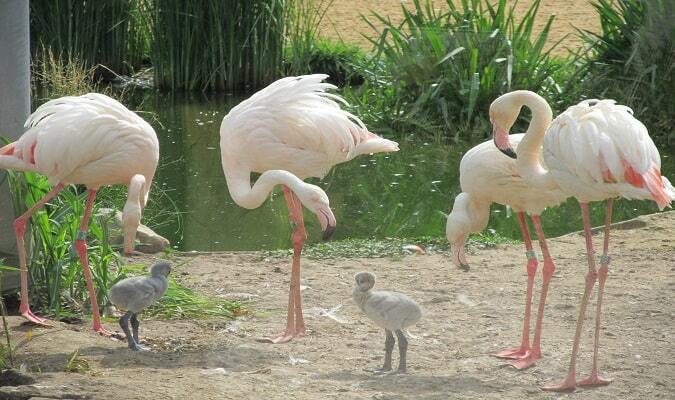 The Erfurt Zoo is home to over 1600 animals, representing 193 species. The Schloss Molsdorf is one of the most beautiful Rococo palaces in Thuringia. It was built between 1736 – 1745. 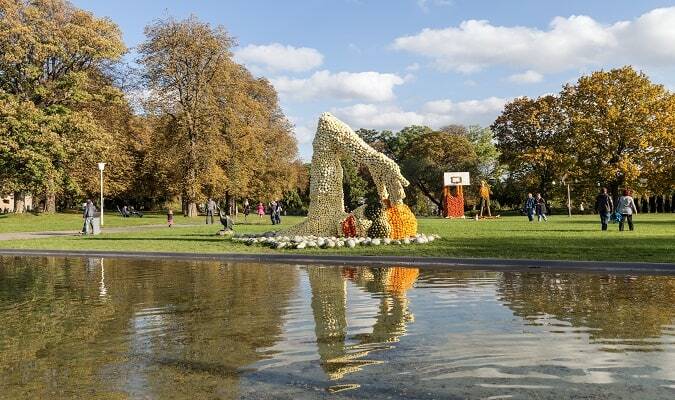 The Egapark has numerous attractions including gardens, playgrounds and the German Horticulture Museum. The Angermuseum is one of the leading art museums in Erfurt. The Lorenzkirche is a small 14th century Gothic church located 950 meters from the cathedral. The Gleichen, Mühlburg and Wachsenburg castles are collectively known as “Drei Gleichen“. They are located 20 km from Erfurt. The Radisson Blu Erfurt is located a 10-minute walk from the historic center. Rooms are equipped with a flat-screen TV, minibar and coffee maker. 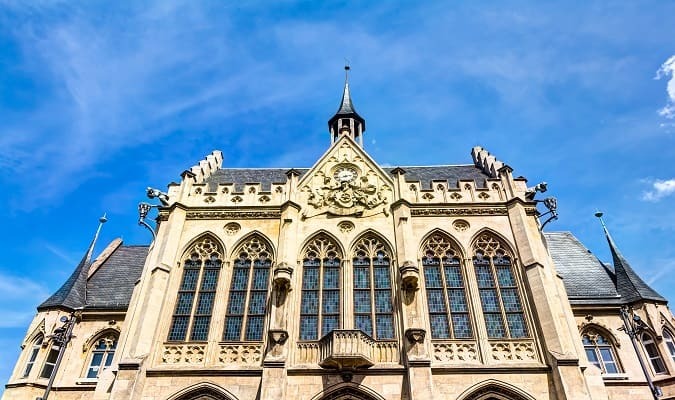 The Dorint Hotel am Dom Erfurt is located 400 meters from the cathedral. Rooms are equipped with a flat-screen TV, work desk, safe, minibar. 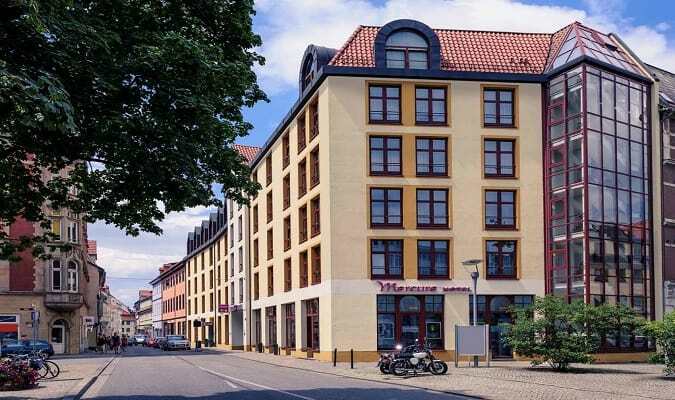 The Mercure Erfurt Altstadt is located 1 km from the cathedral near the Krämerbrücke. The Anger 1 is located 1 km from the cathedral. Brands: Pandora, Camp David, Gabor. The Thüringen Park is located 7 km from the old town. Brands: Bonita, Esprit, Gerry Weber. Erfurt has easy train access from various cities in Germany. Famous cities nearby: Leipzig, Dresden, Nuremberg, Kassel.